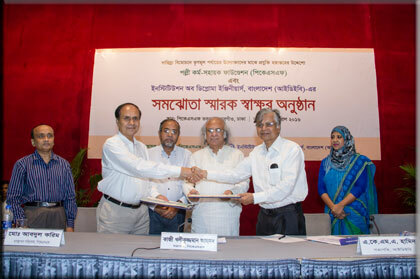 A Memorandum of Understanding (MoU) signing programme between Palli Karma-Sahayak Foundation (PKSF) and Institution of Diploma Engineers Bangladesh (IDEB) was held in PKSF Bhaban on 26th April 2016, with an objective to transfer pro-poor technology among grass-root level entrepreneurs. Keeping the pace of rapid growth and enhancement of poverty reduction activities among poor people, PKSF is usually spreading appropriate technologies and technical assistance innovated by different specialized institutions through its Partner Organizations (POs). In continuation to such efforts, PKSF and IDEB signed the MoU with a view to enhancing productivity in agricultural and non-agricultural sector and to expand relevant technologies and machineries as developed by IDEB for grass-root farmers and entrepreneurs. Mr. Md. Abdul Karim, Managing Director, PKSF and Engineer A.K.M.A. Hamid, President, Central Executive Committee, IDEB signed the MoU in presence of Dr. Qazi Kholiquzzaman Ahmad, Chairman, PKSF. In accord with this MoU, IDEB will provide with necessary assistance regarding agricultural and non-agricultural technologies for programmes and projects that are being implemented by PKSF. Moreover, PKSF will assess the demand for technology, technical assistance, training etc in consideration of all the hurdles related to the technologies of different economic sectors. To this end, IDEB will provide necessary assistance for solving technological problems of any subsector as identified by PKSF. 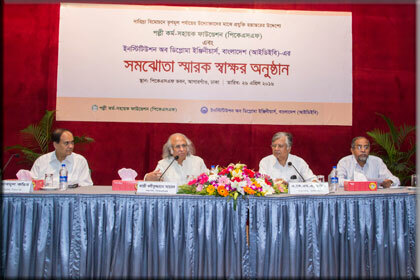 It is expected that, a new dimension is to be added to ongoing activities of PKSF, in particular both increasing productivity and income of microenterpreneurs, through this alliance.